Creative Coding Utrecht (CCU) is an interdisciplinary and open community of musicians, designers, programmers and visual artists investigating the influence of technologies on our daily life through a playful and explorative approach. Challenging the binary opposition ‘human’ and ‘machine’, CCU works in terms of dialogue and critical making focusing on new forms of expression through digital technologies and highlighting the making processes behind it. This offers alternative ways to discover what’s behind the computer screen as a starting point to engage a conversation on the transformation of society from daily habits to global issues. Bringing together the diverse activities of this vibrant community, CCU organised Hello World! group exhibition representing the diversity of coding practices. In this interview, Fabian van Sluijs, one of the founders of CCU, talks about the creative community in Utrecht, CCU’s activities and the impact of how creative coding can put new perspectives on the impact of technology on society. Costanza Tagliaferri: Could you introduce your background and your interest in creative coding? 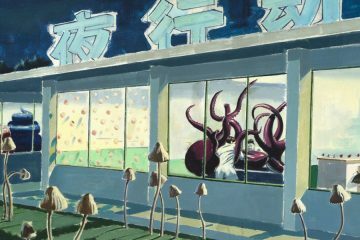 Fabian van Sluijs: As my parents were gallerists, I grew up surrounded by contemporary art. 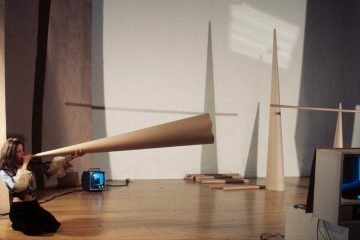 In the 90’s they presented the work by VJ Micha Klein and brought club culture to the art world. In hindsight, this was already one of my first encounter with digital art and I suppose these early influences have formed my later interests. In my twenties, I did not know what I wanted to do. So I decided to study art history and cultural studies as a way to give context to my upbringing and deepen my interest in “low-brow” culture and film. In the meantime, I was DJing throwing house parties with my friends and visiting festivals. At some point, two groups of friends joined forces and we founded FIBER Festival in Amsterdam. Being involved as an organizer and curator in the field during my studies was really nice. I always had a case study to put theory into practice and vice versa. During my Master, I followed a course called software studies and this became a pivotal moment where two discourses came together. On the one hand, a discourse within Art History around studio studies which takes a new materialist perspective on the notion of creativity and the production of art. It looks at the influence of the studio, its processes and other influences such as materials and tools influence the production of art. On the other hand, software studies offered me another theoretical framework to look at the layeredness of software and interfaces which I could connect with the digital tools my friends were using: namely, creative coding frameworks such as vvvv and Processing. I became increasingly interested in how these tools are produced through peer-to-peer knowledge sharing practices and a whole range of community events such as festivals and meetups. Here, I saw a manifestation of transcoding where the ideology of online internet culture is transforming more physical forms of organization and culture. 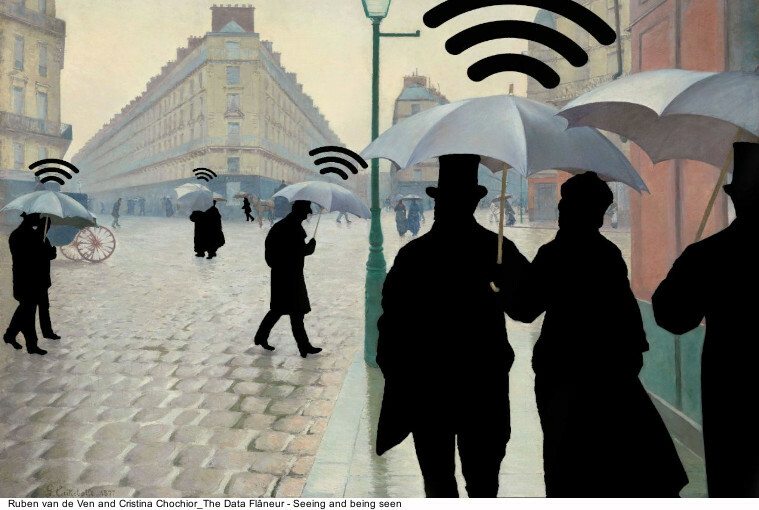 This is an element of what Florian Cramer has called a manifestation of the post-digital. Based on this idea I became increasingly interested in how this transcoding happens in the practices surrounding creative coding culture. Within creative coding ideas like co-creation, Do-It-With-Others (DIWO) and inclusivity are being heavily promoted. The meetup creative code Berlin and the summer courses organised by School of Machines Making and Make Believe and an organization like Code Liberation explicitly employ feminist strategies and promote the participation LGBTQ community. According to Sci-fi philosopher and researcher Professor Alan N Shapiro we need more creativity in the development of technologies to tackle the social problems the tech industry has to deal with. In creative coding, he recognizes a potential to achieve that. This, of course, raises the question to what extent creative coding stimulates this and how these ideas are embedded in the fabric of creative code. These questions motivated me to research creative coding culture, and not only look at experiments with technologies and new forms of storytelling, but also how the technical organisation of a platform influences the distribution of these ideals. After finishing my master (which took me ages), I decided that I want to conduct research hands-on. At the same time, I saw that my hometown Utrecht was becoming more vibrant and lively but was still lacking a place for people interested in creative technologies to meet and share knowledge. That’s why I decided with co-founder and artist Carolien Teunisse to set-up Creative Coding Utrecht. Costanza Tagliaferri: What is the intent of Creative Coding Utrecht and what is special of the Utrecht community? Fabian van Sluijs: CCU aims to stimulate the community of professionals, students and other people interested in creative technology through with a range of activities such as workshops, code jams and meetups. Research is also a core activity that is embedded in everything that we do. We always interview makers to see what are important influences in their work. With this, we aim to stimulate reflection on creative coding as a discipline and the importance of playing and experimentation with technologies in our current society. This way of employing this type of research is what makes CCU stand out within the scene of creative coding meetups. Focusing more on our community, we explicitly focus on building bridges between disciplines: from developers to designers, from researchers to media artists. Utrecht is a student city which houses the Utrecht University of the Arts (HKU), Utrecht University and a lot of vocational studies focused on media and communication. The HKU has a strong game department and a nice bunch of people connected to the department for electronic music production and composition. Their teachers are regulars at our events and we increasingly present the work of students that is often focused on experimental music and audio-visual performance. 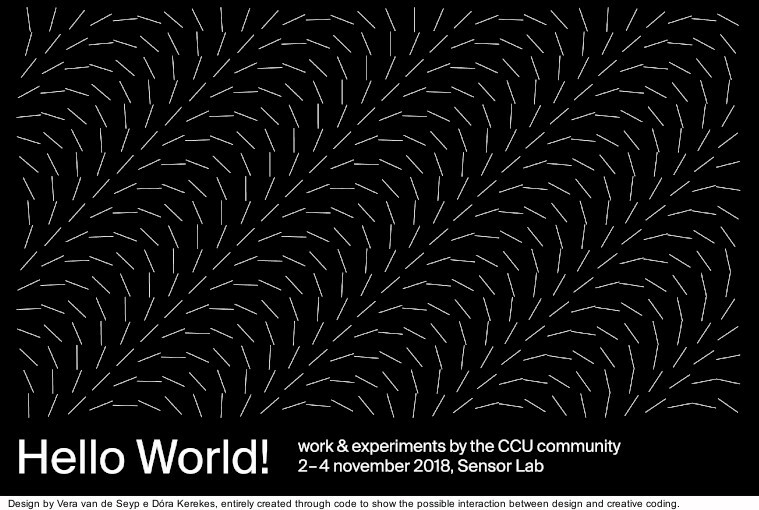 Costanza Tagliaferri: At the beginning of November, you curated the art exhibition Hello World!, presenting for the first time the works of the creative coding community-based in Utrecht. Why this title to narrate the original idea? Fabian van Sluijs: We choose the title Hello World! because it’s an inviting phrase to present ourselves as new organization local community to the residents of Utrecht saying: ‘look, here we are!’ But of course, Hello World! also refers to the first program you create when learning how to code, it shows the syntax of a programming language and we thought that it’s a nice metaphor to showcase the diversity of people, practices and works related to our idea of what creative coding entails. Costanza Tagliaferri: Could you tell us how did you select the artists of this exhibition to explore the aesthetics of creative coding? Fabian van Sluijs: We structured the exhibition around 3 perspectives. The first was focused on how creative coders can use their skills to question the technologies that are embedded in our daily lives. The 2nd strand was more focused on how digital is a process that creates not only digital media but can also transform physical materials. The last strand focused on the presentation of making processes. An example of the first perspective was Sylvain Vriens work Immer Geradeaus, which questioned how our perception of the city changes if we would perceive the world through the lens of navigation software. Jasper van Loenen explored how a neural net perceives the city. Both projects worked with Google Maps satellite and street view images. Together with Mark van Koningsveld’s presented the work Hokjesbots. It’s an installation attempting to deconstruct Tinder’s categorization algorithms. These projects showed how you can hack, transform and question the digital services we use through the creative use of software and data. Cristina Cochior and Ruben van de Ven presented The Data Flaneur, an artistic version of Alison Powell’s Data Walks, where participants walk through the city to explore and discuss the manifestations of data collection in the built environment. This project came out of a collaborative workshop we did at the beginning of 2018. It explores the more affective elements around data collection. 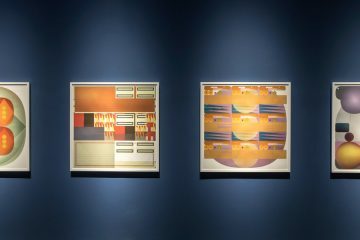 The second strand in the exhibition focused on the use of generative processes and autonomous systems to create form experiments. It also represented how you can transform physical materials through these processes. Here we’d presented the work of Saskia Freeke, who presented laser cut wooden reliefs. The shapes she cut were derived and assembled from the processing sketches she posts daily since 2015. 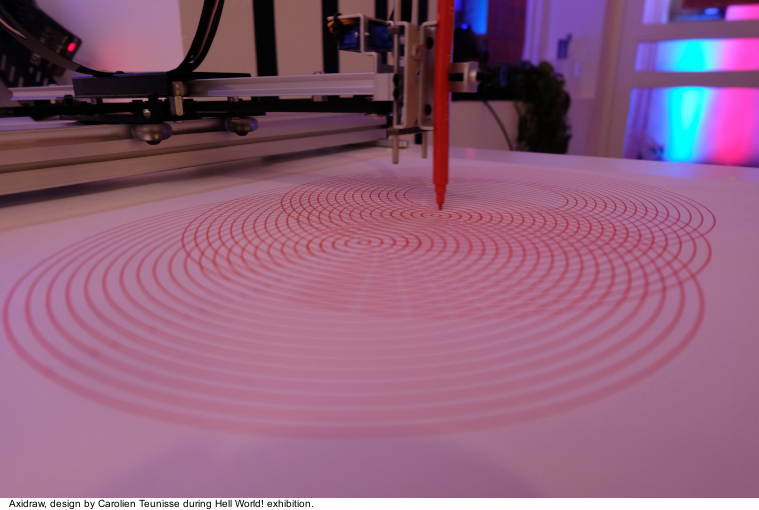 I also invited Frederik Vanhoutte, a creative coder from Belgium, who makes these amazing drawings with the Axidraw, a plotter. But we also invited Wouter Willebrands who in contrast to the plotter is an illustrator who draws everything by hand. His work is based on systems he design and which are often inspired by natural processes or physics. 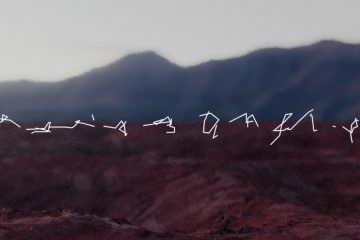 I thought it was interesting to present the work of creative coders in more physical form also as a way to show how the digital is just a process that can be translated to physical forms. 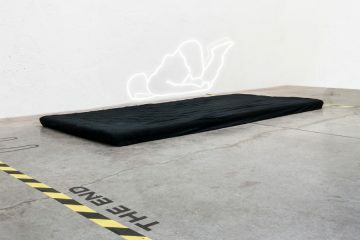 The last strand was focused on highlighting the materiality of the digital and showing experiments and making processes. I curated this in collaboration with anthropologist Axelle van Wynsberghe. We used the format of the 19th-century wunderkammer to create the creative coding cabinet of curiosities. 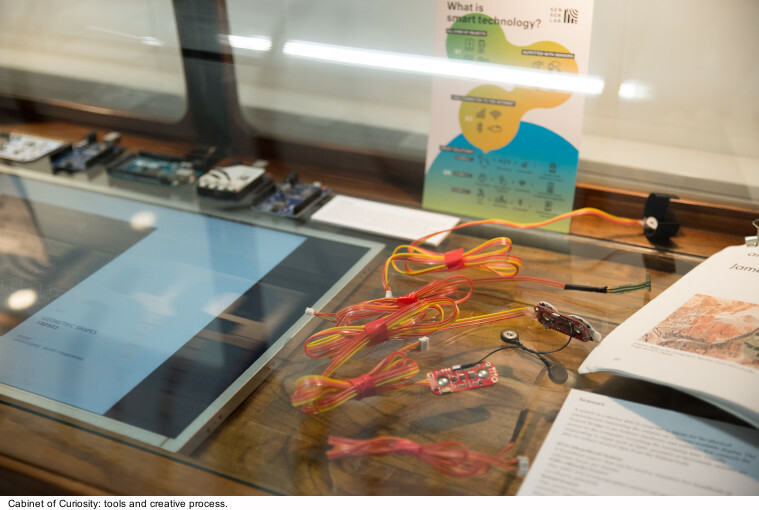 As the exhibition was located at Sensor Lab, a data driven design studio, we had a maker space inside the venue. This is a greenhouse with working places and tools for physical computing. This naturally lends itself perfectly to showcase the ‘making of’. We also brought in a teak wooden cabinet where we showed the elements of computers, literature and video’s of some of the processes behind the works we were presented in the other parts of the exhibition with a selection of interviews with the artists where they reflected on the meaning of creating coding and the role of the community in working with creative coding tools. Apart from the physical objects, we also showed other experiments. Sabrina Verhage presented an experimental public survey. In this installation, a laptop made snapshots from people who stood in front of the camera. Then a so-called t-SNE Algorithm that would sort all the people based on a selection of algorithmically defined characteristics. Above the laptop, we presented a collage on a screen that would be updated every few minutes. You could say that the greenhouse was the backend of the projects we presented in the exhibition. Just like the early 19th-century practice of the wunderkammer we brought together the tools and artefacts that artists and scientists employ to make sense of the world. Costanza Tagliaferri: Among the artworks, the exhibition proposed talks, sound performances, workshops and meet-ups. What do these activities add to the exhibition? How these activities are representing CCU’s activities in combination with the exhibition? Fabian van Sluijs: In order to show the diversity of the community, we made various program formats as a way for the audience to be part and interact with the community. As the exhibition was part of the culturele zondag (Cultural Sundays), a citywide cultural program, we had the chance to organize the first Algoravein Utrecht, at the music venue EKKO. Prior to that, we organized a meetup around live coding prior to the rave. The following days we organized panel discussions around creative coding and design and beginner workshops p5.js. All these activities were moments for the audience to get a bit more context and understanding behind the presented works and their makers. Through the hands-on activities, people could also get their hands dirty by coding some things themselves. 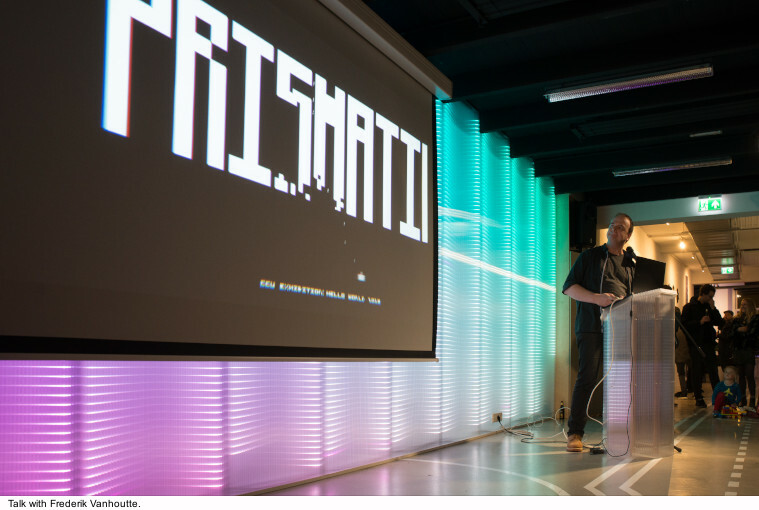 Costanza Tagliaferri: What are the future projects of Creative Coding Utrecht? Fabian van Sluijs: In 2019 we’ll continue stimulating creative coding through hands-on events and our research on creative coding culture and practices by expanding our collaborations with partner organisations. We’ll be hosting aProcessing Community Day in Utrecht and Amsterdam on the 26thof January and the 6thof February. We’ll kick off the ReCoding trajectory in which we’ll recode some work of pioneers in media art and present some new interpretations of these works. This project is inspired by the Recode Project from Matthew Eplerand by The School for Poetic Computation. Plans for the latter part of 2019, such as a Summer Course on Machine Learning, are still in the pipeline. But for now, we can announce that we’ll be collaborating with Uncloud festival and present an afternoon with talks and performances in February. In March we’ll collaborate again with Utrecht University on a workshop around civic data commons. Our aim is to approach this question from a more than human perspective and see if we can introduce a non-anthropocentric approach to Smart City developments.